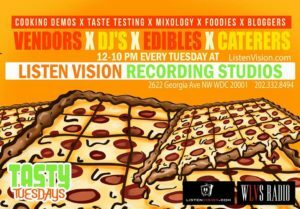 An ALL DAY/NIGHT Food Event at Listen Vision, DC’s Largest and Oldest Recording Studio located at Howard U’s entrance. From 12-10pm Caterers, Chefs, Restaurants, Bakers, Chocolatiers, Edible Makers, Juice/Smoothie Shops, Food Bloggers LIVE Streaming Cooking Demos and Taste Testing ALL DAY On-Air and On-Camera via WLVS Radio (The Largest Internet Station in America). Come out for Special Discounts on Food, Studio and Radio Services Only Offered on TUESDAYS: 2622 Georgia Ave NW WDC 20001 Call 202.332.8494 for more info.